Which are the Part-66 licences? Part-66 EU Regulation can be found on the Agency website as Annex III to Commission Regulation (EC) 2042/2003 and can be ordered from the Technical Publications page. OJT for the first TR (66.A.45). The following two schemes depict the most common paths and are for information only. The first scheme applies to Group 1 aircraft (B1 and B2 licence categories). The second scheme applies to other than Group 1 aircraft (B1 and B2 licence categories). NOTE: Aircraft groups are described in 66.A.5. These schemes do not override Part-66 requirements nor capture all the possibilities (various licences, educations and experiences). The start and end of each phase can vary depending on individual cases. Consult the Competent Authority where you intend to apply for the AML. An aircraft maintenance licence issued by a country other than EASA Member States cannot be rendered valid as EASA Part-66 AML. Part-66 licences issued by the countries other than EASA Member States are not mutually recognised in European system. 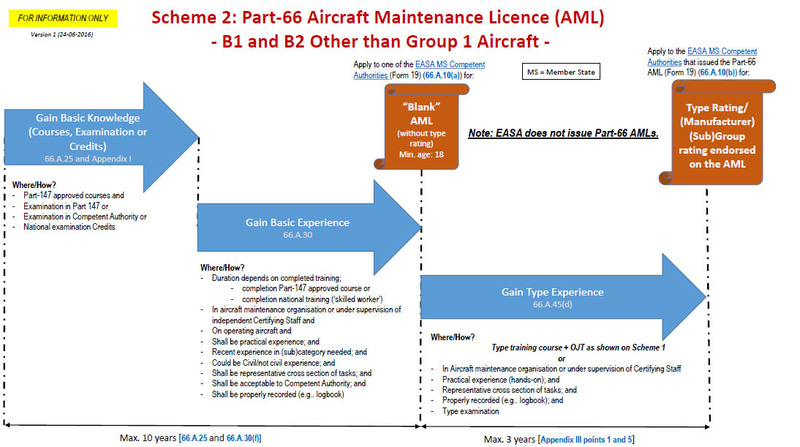 How can I apply for an EASA Part-66 licence? What is required at the time of the application? The initial application for a Part-66 aircraft maintenance licence shall be made to the competent authority of one of the member states. Please contact this competent authority for an application form (form 19) and specific details concerning the application. The form 19 shall be submitted to the Member States together with evidence of compliance with the requirements. Member states will specify the related fees and how compliance with the requirements shall be demonstrated. See Part-66.A.15.10, 66.A.15, 66.A.25, 66.A.30, 66.A.45 and 66.A.70 and related AMC/GM. An application for amendment or renewal of a Part-66 aircraft maintenance licence shall be made to the competent authority of the member states who issued the licence. Please contact this competent authority for an application form (Form 19) and specific details concerning the application. See Part-66.A.15.10, 66.A.15, 66.A.25, 66.A.30, 66.A.40, 66.A.45, 66.A.50, and 66.A.70 and related AMC/GM. Who is allowed to issue EASA Part-66 licences? Can I apply for a Part-66 licence to EASA? EASA is not a licensing authority and therefore does not issue any licences. Part-66 licences are issued by the competent authorities of the EU Member States, plus Switzerland, Norway, Iceland and Liechtenstein. The list of the National Aviation Authorities and their contact details can be accessed here: http://easa.europa.eu/the-agency/member-states . I want to work in an organisation located within the EU. Do I need a Part-66 licence? work in maintenance organisations as support staff. For other activities within a maintenance organisation, a Part-66 licence is not required. No Part-66 licence exists for components (based on article 5 of Commission Regulation (EU) No. 2018/1142). Remark: Privileges on the basis of national requirements may be added in the Part-66 licence in section XIV. national privileges. I am a colour-blind. Does this prevent me from getting a Part-66 licence or exercising my licence privileges? Regulation (EU) 1321/2014 does not require any medical examination before applying for a Part-66 licence. Part-66 has only a provision to suspend, limit or revoke licences in case of carrying out maintenance or issuing a certificate of release to service when adversely affected by alcohol or drugs [66.B.500 point(7)]. Common sense recommends the certifying staff not to exercise the privileges of their certification authorisation if they know or suspect that their physical or mental condition renders them unfit to exercise such privileges (impact to the safe maintenance operations). In addition such recommendation may be covered and rendered mandatory by the national requirements of the Member State where you exercise your privileges. Typical examples are for intoxication (alcohol, drugs, etc.). as the ICAO safety management system encourages to identify hazards and risks. Please find an agreement with your company in order to list the maintenance tasks that you are allowed to carry out without jeopardising the aircraft safety. Note: The same reasoning as explained above applies for any medical condition. Does EASA plan to propose changes to the implementing regulation to establish specific adaptations applicable to persons with learning difficulties (e.g. dyslexia, attention deficit disorder, hyperactivity,…) who wish to undertake aircraft maintenance training in a Part-147 approved training organisation as required to apply for Part-66 licenses? Anybody able to pass the basic knowledge examinations and fulfil the basic experience requirements can get the related Part-66 licence. There are no additional conditions such as a medical certificate or any other proof regarding the mental or physical abilities. In other words, people with specific learning difficulties or physical impairments are not discriminated by Part-66 or Part-147. Obtaining the licence does not give the certification privileges. Before granting such privileges, the maintenance organisation will have first to check the competence, including the assessment of the skills and abilities and considering the Human Factors principles. The scope of the certification authorisation will be commensurate to these competence/abilities. Please note that in some EU Member States additional occupational safety and health requirements may apply (working on heights, confined spaces, etc.). EASA does not plan to propose amendments to the regulations to account for cases of people with special needs during examinations: a single regulation cannot cover all individual cases. If a Member State intends to introduce any such adaptation, Regulation EU 2018/1139 (the NBR) includes the possibility for the Member States to grant an exemption under the Article 71(2), after evaluation of the individual conditions for the case. As an additional information, the Agency already issued several positive recommendations for such exemptions (e.g. for candidates with confirmed dyslexia, i.e. 25% additional time). Please contact your competent authority for details. For further information about the flexibility provisions under the NBR, please see 'Safeguard & Flexibility Provisions'. How can I get a Part-66 licence valid in the EU by conversion? JAR-66 licence, which will automatically be re-issued as Part-66 licences as they are deemed to have been issued in accordance with Part-66. This does only apply to JAR-66 licence issued by the countries listed on the Mutual recognition page. Furthermore, 66.A.70 allows conversion of qualifications valid in a Member State in very specific and limited cases. For personnel studying a qualification at a University or a degree in a country outside of the EU: I am studying aeronautics and I wish to obtain an EASA Part-66 licence? May I get a credit or may I get a licence based on my degree? No, unless the basic knowledge got outside of the EU is acquired in a Part-147 training organisation approved by EASA, according to 66.B.405. Which documentation is required to support the application demonstrating compliance with the experience requirements? Maintenance experience should be written up in a manner that the reader has a reasonable understanding of where, when and what maintenance constitutes the experience. A task-by-task account is not necessary, but at the same time a bland statement such as “X years maintenance experience completed” would not be acceptable. A maintenance log book detailing the experience is desirable and some competent authorities may require such a log book (see AMC 66.A.10). Consequently, the format used to evidence the maintenance experience is not strictly defined in the rules and is left at the discretion of the competent authority issuing the licence. Hence, EASA advises you follow the instructions of the competent authority where you intend to apply for. Where do I gain the required basic maintenance experience? Is it mandatory to gain the required maintenance experience in an EASA approved Part-145 organisation? It is not mandatory to gain maintenance experience in a Part-145 organisation. 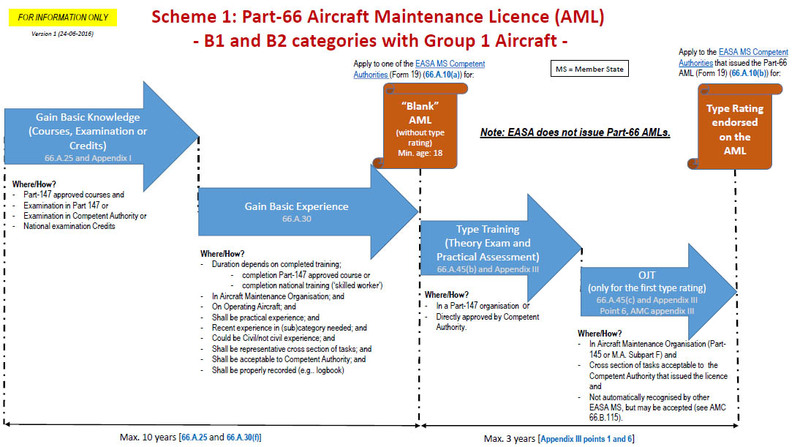 According to the AMC 66.A.30(a)(4), aircraft maintenance experience gained within different types of maintenance organisations (under Part-145, M.A. Subpart F, FAR-145, etc.) or under the supervision of independent certifying staff may be accepted by the competent authorities. This means that the aircraft maintenance experience may be accepted by the competent authority when such maintenance is performed in a maintenance organisation which does not necessarily hold an EASA Part-145 approval. Furthermore aircraft maintenance experience gained outside a civil aircraft maintenance environment may include aircraft maintenance experience gained in armed forces, coast guards, police, etc., or in aircraft manufacturing. However, it is on the competent authority to evaluate whether this experience is acceptable. Consequently, please contact the competent authority where you intend to apply for a licence, in order to check whether the basic experience would be acceptable. See Part-66.A.30 and related AMC/GM. I work as a mechanic in the military field on aircraft being also certified for civil operations. In order to obtain the Part-66 licence, why do I need additional experience of civil aircraft maintenance as required by 66.A.30(e) on top of my experience in the military field? As stated in 66.A.30(e), for mechanics having a military background and seeking a Part-66 licence, the objective is to ensure adequate understanding of the civil aircraft maintenance environment, not only because of possible different aircraft technologies, but also because of practices linked to the civil environment. Not only the technology or systems of the civil aircraft might differ from the military aircraft version configuration (e.g. no video entertainment system; no sliding chutes; different fuel or electrical systems) but the experience gained in the military environment might also significantly differ from the scope of work of the civil maintenance organisation, its procedures and policies (e.g. use and meaning of the certificate of release to service - EASA Form 1, standard parts, store and tools procedures, use of the maintenance documentation such as ADs, SB, SIL…, quality and safety management system; human factor aspects, continuing airworthiness record systems…). In addition the interaction with the customers (i.e. the airliners) induces new practices such as use of the aircraft technical log book, MEL, aircraft defect rectification and deferment of items; use of customer documentation (e.g. MPD, MRB, SRM, IPC); interaction with the crew; how to behave with the passengers; special procedure such as (re)fuelling, de-icing /anti-icing; communication with the tower or moving on the apron. The military regulations widely differ from country to country, with certain countries having military rules similar to the EU ones, while others have very different rules. The 12-month additional civil maintenance experience average (as per AMC 66.A.30(e)), has been agreed by the Member States and accepted as a standard way to demonstrate compliance with the rule to achieve mutual recognition and adequate degree of standardisation. I have completed my EASA Part-66 modules for B1 and I have passed all the exams, but I still lack experience to get my licence. Is there a time limit to get the licence ? Will the certificate expire in a few years if I do not get the experience? According to Commission Regulation (EU) No 1149/2011 of 21 October 2011 (amending Regulation (EC) No 2042/2003), the basic examinations shall be passed and experience shall be acquired within the ten years preceding the application for an aircraft basic licence. The new regulation also states that for the purpose of time limits related to basic knowledge examinations, basic experience acquired before the Regulation applies, the origin of time shall be the date by which this Regulation applies, which is 01/08/2012 (which means until 31/07/2022). I hold a Category A1 Part-66 licence. What are the requirements to extend my licence to Category B1.1? Two years of practical maintenance experience on operating aircraft in the B1.1 category (not in the A1 category) is needed before applying for the extension. This experience need to be accumulated within the 10 years preceding the application. The experience requirement will be reduced by 50% if the applicant has completed an approved Part-147 course relevant to the category extension according to Appendix IV of Part-66. See Part-66.A.15.10, 66.A.25, 66.A.30 and related AMC/GM. I already hold a Part-66 licence and I would like to include an additional basic (sub)category? Which additional (sub)modules are required to be passed for the addition of that new (sub)category? According to 66.B.100(b), the competent authority shall verify that all required modules of Appendix I to Part-66 related to that new (sub)category sought are met. Credit can be granted as regards to the basic knowledge of the (sub)category for which the licence has been already issued. This means that a comparison of the basic knowledge (gap analysis) will have to be done between the different (sub)categories. Such a comparison has not been yet done once and for all in Commission Regulation (EU) No 1321/2014 due to the different potential cases (wide diversity of (sub)categories). Therefore such a comparison should be done by the Member State that has already issued the Part-66 licence, before the applicant is enrolled in such a “gap” basic knowledge course. Please contact your competent authority, which may have already performed this comparison. Some competent authorities may have already posted such comparison(s) on their websites; however be sure that the comparison relevant to your case is acceptable to the competent authority who issued your licence. In addition the applicant will have to comply with the additional experience requirements for the new (sub)category sought, as detailed in Appendix IV to Part-66. What is a difference between examination and assessment? Why are there two different examination standards, respectively in Part-66 Appendix III, points 4 and 5? Examination is a written form of demonstration of a certain level of theoretical knowledge by the student based on achievement of the learning objectives, usually performed on completion of a theoretical training course or a portion of a course. The student shall demonstrate, to the levels identified in the table in Appendix III, the detailed theoretical knowledge of the aircraft’s applicable systems, structure, operations, maintenance, repair, and troubleshooting according to approved maintenance data, as well as the use of manuals and approved procedures, including the knowledge of relevant inspections and limitations. The standard, format, pass mark, etc. are defined in Appendix III, 4.1. The examination shall be performed by the appropriately trained and approved examiner. Assessment is a practical form of measuring the competence of the student by evaluating three major factors associated to the learning objectives: knowledge, skills and attitude, usually performed on completion of a practical training course. The assessment should focus on the competencies relevant to the aircraft type and its maintenance. The principles on how to perform the competence assessments are given in the AMCs to Part-66, Appendix III. The assessment shall be performed by appropriately trained and approved assessors. Regarding Part-66 Appendix III, point 5., “Type Examination Standard” does not apply to the examination performed as part of type training. This point only applies to those cases where type examination is performed as a substitute for type training, which means it is intended for the examinations conducted by (or on behalf of) the competent authority on those aircraft that do not require a type training (typically Group 2 and Group 3 aircraft according to Appendix I to the AMCs to Part-66). So, it is true that the examiners authorised by the competent authority shall not have been involved in the applicant's training. In all other cases AMC to Part-66 Appendix III applies, which means that the roles of the assessor and the instructor may be combined for the practical elements, depending on the size of the organisation. Regarding the roles of examiners and assessors, these are different functions (which does not prevent that one person can’t be authorised both as examiner and assessor). Normally, these functions should not be confused. The expression “The examination shall be oral, written or practical assessment based, or a combination thereof, …” applies only for Section 5, i.e. “Type Examination Standard”. I have passed the aircraft type rating training (TRT) in an approved EASA Part-147 organisation, although I have not completed the basic knowledge training. Is this TRT valid for life? Would it be possible to endorse it on my Part-66 licence as soon as I get one? Aircraft type rating training must have been started and be completed within the 3 years preceding the application for a type rating endorsement (Part-66, Appendix III, paragraph 1 refers). From an intellectual point of view, this is not logical to demonstrate maintenance competence on a specific aircraft type without having acquired the basic knowledge, skills and attitude related to the maintenance and the technologies used in aviation in general. Legally speaking the situation is not forbidden. However be sure that you get your licence within the 3-years’ timeframe from the date you passed the TRT course. I have attended a type training, may I immediately ask my authority to endorse it on my licence? and for B1 and B2 licences, in case where the aircraft type is the first in a licence category or subcategory, an OJT training has been performed. I hold a licence with a type rating and I wish to add the rating of a similar aircraft of the same manufacturer. For example: I have a type rating on Airbus A320 Series, and I wish to add the rating on A330 Series. Do I need a complete course? If aircraft types of the same manufacturer have different type ratings as stated in Appendix I to AMC to Part-66, there is a gap of knowledge gap preventing the endorsement of the second aircraft type. E.g. the Airbus A330 (GE CF6) is a different rating to the Airbus A318/A319/A320/A321 (CFM56). a differences training course, theoretical and practical for Airbus A330 (GE CF6) compared to Airbus A318 (CFM56) (and/or A319/A320/A321) as described in Appendix III point 1(c). Those training courses may either be provided by a Part-147 training organisation or by the competent authority. Remark: A Part-147 organisation difference training is not required for variants within the same aircraft type rating, for example: from A320 to A321. Nevertheless, some training to cover the differences may be necessary. This may be provided by an approved maintenance organisation, before issuing the certifying staff authorisation, (see AMC to Paragraph 1(c) of Appendix III to Part-66 ‘Aircraft Type Training and Examination Standard. On-the-Job Training’). I just got an empty Part-66 licence. I plan now to get type ratings. Are 2 weeks practical training sufficient? As per the new Regulation (EC) No. 1149/2011, the practical element of training is no longer a question of time. The duration of the practical training should be adequate in order to complete the contents required by paragraph 3.2 of Appendix III to Part-66. For aeroplanes with a MTOM equal or above 30.000 kg the duration for the practical element of a type rating training course should not be less than two weeks. In addition, for B1 and B2 licences, where the aircraft is the first in a licence category or subcategory, an on the job(OJT) training shall be performed. The Appendix III of Part-66 states that a type training course shall be started and finished within 3 years before the application for a type rating, is this still valid if I started the course before 1 August 2012? Type training courses started and finished before 01 Aug 2012 can be used for rating endorsement application until 31 July 2015. Any theoretical type training course finished after 01 Aug 2012 can be used for rating endorsement application until 3 years after they were started (even in the case where they were started before 01 Aug 2012). Any practical type training course finished after 01 Aug 2012 can be used for rating endorsement application until 3 years after they were started (even in the case where they were started before 01 Aug 2012). Is it mandatory to go to a Part-147 approved training organisation to get type training? Can we do this training in a Part-145 approved organisation or at the aircraft manufacturer? This is a one-time approval on a case-by-case basis for a single course or a predefined group of courses i.e. Part-145 approved maintenance organisation cannot receive a permanent approval for aircraft type training. The course and the assessment complies with the same standard valid for approved Part-147 organisations; this standard is described in paragraph 1 to 4 of Appendix III to Part-66. No Part-147 Certificate of Recognition can be issued for the purpose of the mutual recognition between Member States. However, an appropriate training certificates can be issued after successful completion of both elements. Directly approved aircraft type training course is only valid for Part-66 AML type rating endorsement by that Member State, which means it cannot be used for aircraft type endorsement by other Member States (no mutual recognition of the certificate), unless this other competent authority has approved the course as well. What is the intention of the requirement regarding the assessment of the OJT. What is the nature of the assessment for an OJT? What are the differences between practical assessment and OJT assessment? What are the objectives of the OJT assessment? Candidates following practical element of type training. To conduct the final assessment of the completed OJT, whereas the candidate’s competence is indirectly justified. Reference: Appendix III, 6.; AMC to Section 6 of Appendix III 8. Reference: Appendix III 6.; AMC to Section 6 of Appendix III 1. To evaluate if the candidate has gained the required competence in performing safe maintenance, inspections and routine work according to the aircraft documentation and other relevant instructions and tasks as appropriate for the type of aircraft. To confirm the completion of the required diversity and quantity of OJT, based on the supervisor(s) reports and feedback. It is sufficient that the completion of individual OJT tasks is confirmed by the direct supervisor(s), without being necessary the direct evaluation of the assessor. Reference: AMC to Section 6 of Appendix III 7. & 8. (OJT) What is the meaning of the following statement in Part-66 Appendix III, Section 6: “The final assessment of the completed OJT is mandatory and…”? check that the competence of the candidate was positively assessed. In case of doubt, the assessor may decide to proceed him/herself to an additional evaluation of the candidate or perform a gap analysis when the OJT procedure is not fully met such as an insufficient number of tasks or diversity of tasks or unclear supervisor’s report regarding the candidate’s performance. The supervisor should not sign the actual task if the person did not achieve the required competence in safe task performance. subsequently addresses young mechanics (e.g. “newcomers”) or mechanics having no experience in that new (sub)category of aircraft (e.g. extension of the license). “The function of the assessor, as described in Section 6 of Appendix III to Part-66, is to conduct the final assessment of the completed OJT. This assessment should include confirmation of the completion of the required diversity and quantity of OJT and should be based on the supervisor(s) reports and feedback”. It is left to the decision of the competent authority how to comply with this requirement: the AMC as suggested by the Agency aims at avoiding additional burden, duplication or over-regulation while proposing a simple final evaluation process. Tasks listed in Appendix II of Part-66 for an OJT are not suited to large aircraft. Shall we select the OJT tasks only from this list? the OJT tasks should be selected because of their frequency, safety, novelty: tasks selected among those frequently carried out by the organisation on this type or more related to safety should be deleted. How tasks for OJT shall be selected for different licences? and those related to a B2: avionics, aircraft electrical system tasks and avionics/electrical tasks within mechanical and powerplant systems. Since the OJT is intended for the first aircraft type endorsement within a given licence (sub)category, does this mean that it can be performed on different aircraft types typical for that (sub)category? OJT shall be performed on the aircraft type for which the applicant is seeking type endorsement. The objective of the OJT is to gain the required competence and experience in performing safe maintenance on that particular aircraft type. However, a certain number of tasks may be performed on other aircraft type(s) (typically from the same manufacturer), only in the cases where such tasks are very similar to the tasks applicable to the aircraft type for which the candidate seeks the type endorsement. The AMC to section 6. of Appendix III to Part-66 states: “Tasks should be selected among those applicable to type of aircraft and licence (sub)category applied for.” Tasks applicable to the aircraft type may be found also on other aircraft types, perhaps not many, but some may fulfil the requirement. A good example would be same engine types installed on different aircraft types (i.e. CFM56 installed on A320 Family and B737). The location of LRUs, oil servicing, IDG, generator, filter change, engine standard practices, etc., those tasks often do not depend on the specific aircraft type (even could be performed off-wing or on spare engine), except the tasks belonging to the airframe - engine interface. The similar can also be applied for the same type of APU installed on different aircraft types or a limited number of other components/systems. Consequently, this may be acceptable, if properly justified to the competent authority within the MOE Chapter 3.15. This flexibility provision is applicable for a limited number of tasks and should not be used to conduct the entire OJT on other aircraft type(s) showing similarities. What should be the content of the OJT procedure in MOE chapter 3.15? Safe release to service of the aircraft after OJT. Note: AMC to Section 6. of Appendix III to Part-66 should be used when defining the content of the procedure. I work in a maintenance organisation approved by the competent authority of a country different from the one who issued my Part-66 licence. An OJT programme via MOE chapter 3.15 has been approved by the competent authority of my maintenance organisation. However, my licensing authority refuses to accept the OJT from the organisation I’m working for. Why? What shall I do? ‘It shall be conducted at and under the control of a maintenance organisation appropriately approved for the maintenance of the particular aircraft type’. ‘OJT shall cover a cross section of tasks acceptable to the competent authority’. Since the procedure in MOE is approved by the competent authority of the maintenance organisation, it can only be used when the licensing authority is the same as the competent authority of the maintenance organisation. In other cases, the licensing authority may accept such OJT after assessing and approving the programme, which should usually be done prior to starting the OJT. This is described in AMC 66.B.115(c) states that “in the case where the licensing competent authority is different from the competent authority of the maintenance organisation which provides the OJT, your licensing authority may take into consideration the fact that the maintenance organisation has the OJT programme already accepted by their own competent authority (through chapter 3.15 of the MOE, as described in AMC 145.A.70(a))”. Since your competent authority is responsible for the issue and extension of your licence, please follow the instruction of your competent authority and try to find a solution based on the above AMC. How can I carry out my OJT in a Part-145 approved maintenance organisation (AMO) whose principal place of business is located outside the EASA Member States? The endorsement of the first aircraft type rating, within a given category/sub-category, requires satisfactory completion of the corresponding On-the-Job-Training (ref. 66.A.45.(c)). The OJT shall be approved by the competent authority who has issued the licence (ref. Part 66, Appendix III, sec. 6). It shall be carried out in a maintenance organisation approved under Part-145 (or M.A. Subpart F) with A rating and the procedures for OJT should be included in the exposition (MOE chapter 3.15 “OJT procedure”) approved by the competent authority of the maintenance organisation. However, since these procedures are approved by the competent authority of the maintenance organisation, and providing training is not one of the privileges of a maintenance organisation, they can only be used when the licensing authority (competent authority issuing the license) is the same as the competent authority of the maintenance organisation. In other cases, it is up to the licensing authority to decide whether it accepts such procedures for the purpose of approving the OJT (ref. AMC to Section 6 of Appendix III to Part-66). For the Part-145 AMOs, whose principal place of business is located outside the EASA Member states, the competent authority of the maintenance organisation is EASA. In such case, the OJT procedures cannot be included in the MOE, due to the fact that EASA is not a licensing authority. The possibility still exists in this case that a licensing authority may directly approve OJT procedures, which have to be included in a separate document outside (and not being part) of the MOE. Option A: apply directly to the licensing authority who has issued the license for the approval of an OJT (to be proposed in a document outside the MOE). This option should normally be considered by organisations and not by individuals. Option B: find an agreement to follow an already approved OJT at another organisation, which was approved by the same licensing authority who has issued the license. Possibility also exists to follow an OJT which was approved by any other licensing authority, however in such case the final acceptance of this OJT for the purpose of endorsing the first type rating in the license remains at the sole discretion of the competent authority issuing the license. It is recommended that prior to starting any OJT, the licensing authority who has issued the license is contacted to verify its acceptance of any possible intended option. I am the holder of a B1.2 licence (i.e “aeroplane piston”). Can I exercise my privileges for piston-engine non-pressurised aeroplanes1 of 2000 kg MTOM and below (i.e. category B3)? By default, a category B3 licence is included in a category B1.2 licence because the basic knowledge requirements (66.A.25(a)) and the basic experience requirement (66.A.30) for a B3 licence are covered by the similar requirements of a B1.2 licence. Provided that the qualification requirements are fulfilled, the B1.2 licence holder can release maintenance tasks performed on piston-engine non-pressurised aeroplanes of 2000 kg MTOM and below. he/she is able to read, write and communicate to an understandable level in the language(s) in which the technical documentation and procedures necessary to support the issue of the certificate of release to service are written. 1 - “Aeroplane” does not include “helicopter”. Can I have endorsed in my Part-66 licence aircraft types for which the Basic Regulation is not applicable? The competent authority of the Member State issuing the licence may include in the Annex (Section XIV) of EASA Form 26 types for which the Basic Regulation is not applicable. The privileges endorsed for these types are based only on the national rules. The use of Section XIV of EASA Form 26 is optional. EASA does not have any information about these types. If you want to get information about them, please contact the competent authority. Is there a requirement to have 6 months’ experience every 2 years to maintain the validity of the Part-66 licence? No, the validity of the Part-66 licence is not affected by recent experience. The requirement of 6 months’ experience within the preceding 2 years ensures that privileges are exercised by certifying staff with sufficient recent experience. If you do not meet the experience requirement anymore, you lose your rights to exercise your privileges of certifying staff or support staff. The licence itself is valid 5 years from the last renewal. Only the certification privileges are affected by the “recency” of experience. when the aircraft does not require an individual training (aircraft belonging in Group 2, 3 or 4), pass a type-examination, including practical assessment (see GM 66.A.20(b)2). Neither a short period of job training session nor an aircraft type refresher training are acceptable. Demonstration of experience should be made on the particular or similar aircraft and the definition of a ‘similar’ aircraft is provided in the AMC to 66.A.20(b)2. As a category A certifying staff at line, can my authority allow me to carry out more tasks than those specified in AMC 145.A.30(g)? the maintenance action required by the MEL is agreed by the competent authority to be simple. When these conditions are met, your authority may allow other tasks to be carried out under AMC 145.A.30g.